My husband has mentioned bean soup several times in the past few weeks. I just smile when he mentions it but secretly I’ve been wondering what bean soup is all about. I admit it; I’ve never had bean soup before! I started looking up recipes for bean soup and came across one for bean and bacon soup that sounded good. 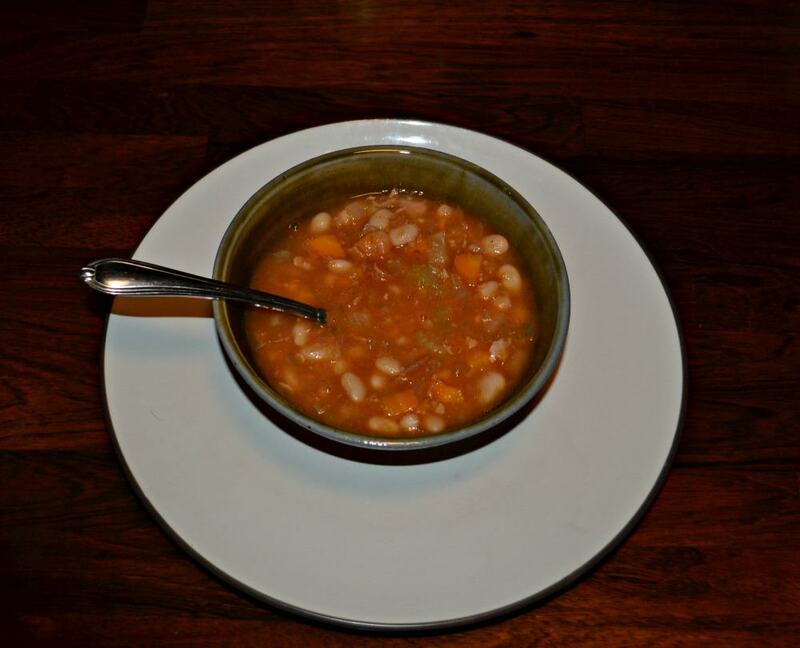 I was surprised that bean soup has a base like many of my other soups with onions, carrots, celery, garlic, and chicken broth. That’s my soup base for chicken noodle soup, potato soup, and several other soups so I was familiar with that part. I decided to make it during the week because it looked like I could make it in under an hour plus there would be plenty left to enjoy for lunch later on in the week. It’s been pretty chilly lately and I figured a big bowl of soup would be appreciated for lunch or dinner. I will say I was surprised by the amount of bacon in the soup. I cooked it all but at the last minute decided to crush up two pieces of the bacon and reserve it to sprinkle on top of the soup. This was a good idea as the bacon in the soup doesn’t stay crisp at all and the crispy bacon on top of the soup adds a nice texture to the soup. The flavor was really delicious. I wasn’t sure what to expect since I’ve never had bean soup before but it had flavors of bacon, beans, and vegetables. The tomato sauce adds a bit of richness to the soup which it really needs. We enjoyed the soup with some Challah bread we received in our CSA this week and that was the perfect compliment to the soup. 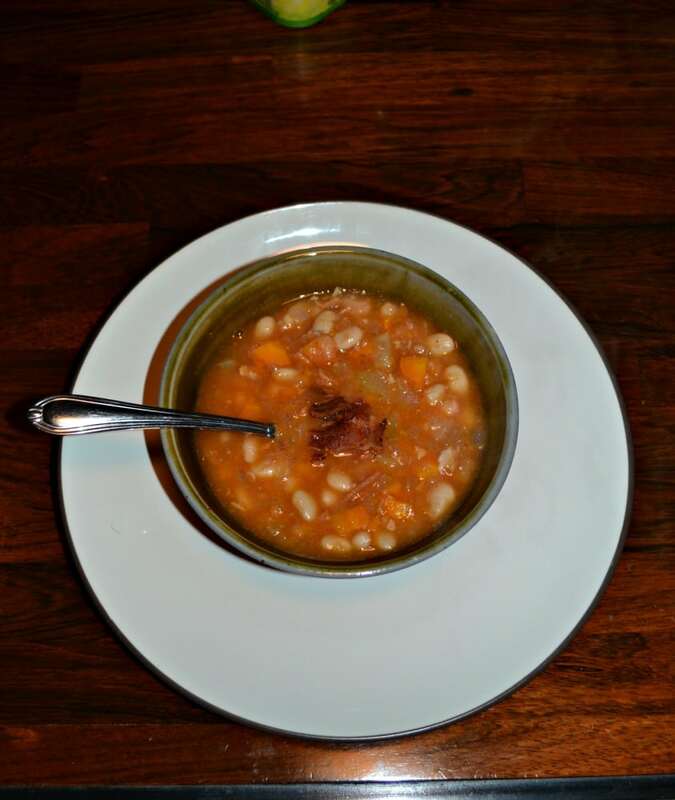 A delicious soup filled with beans, bacon, and vegetables. Chop the bacon into one inch pieces. Place in a large Dutch Oven over medium high heat. Cook the bacon, stirring frequently, until it has browned. 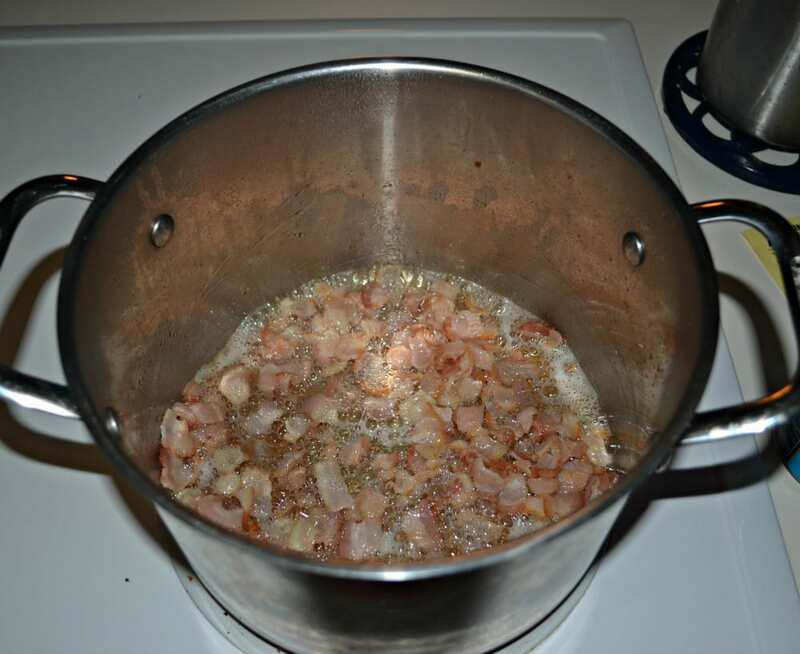 Remove several tablespoons of bacon from the pan and place on paper towels to drain. Leave the remaining bacon and 2 tablespoons of bacon fat in the Dutch Oven. Add the onion, carrots, and celery to the pot and saute for 5 minutes. Add in the garlic cloves and saute for 1-2 minutes or until fragrant. Stir in the chicken broth, Northern Beans, black pepper, and rosemary. Reduce heat and simmer for 20 minutes. Stir in the tomato sauce and simmer for 10 minutes. I love bean soup. 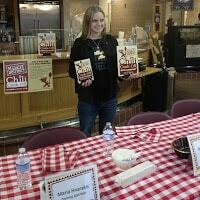 My mom made it often when I was a little girl….then she went on to make baked beans with leftovers! That’s a great idea! I’ve got to try that! 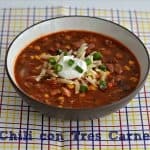 you can really do a lot of different soups with the same base flavors. When I use bacon for a soup, I crisp it first in the pot but then take it all out to crumble over the top at the end, like you did with some. You don’t need too much, but more bacon doesn’t hurt the flavor I’m sure! Such perfect comfort food! I make ham and bean soup, so know we’d love your version! Too funny, I do the same thing when my husband mentions things. Glad you caved and tried bean soup! 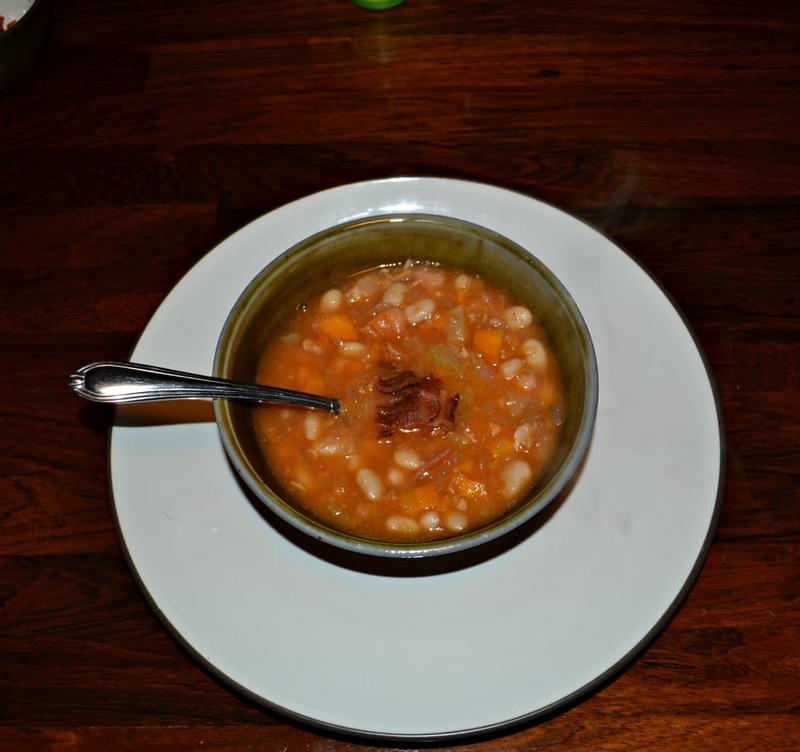 Bean soup is one of our favorites. I have made it with ham and I have made it with smoked sausage. I am anxious to try this version with bacon. It’s really tasty and so easy to make! I agree, bacon makes all soups better! Soup is great comfort food! I’m adding this recipe to my list asap! I made this the other day. I will definitely be making it again but next time I will omit the rosemary because it just didn’t seem to go well with this soup. It did not taste like true bean and bacon soup to me because of the herb. I used fresh rosemary so maybe that is why it was too strong. I will also cut in half the amount of pepper. I did use fresh ground pepper so that is probably why it was much too peppery. But overall I really liked it and will make it again with those two changes. I’m so glad you liked this! I probably over pepper soup because my husband likes it so much but I think your changes sound great!